phone calls, scheduled tasks, notes across suppliers, contacts, employees and cases. Make Every Contact Count by keeping track of phone calls, meetings, document and emails from one database giving designated staff members a 360 degree view on all interactions. Staff can track activities that take place with suppliers, customers and fellow employees. This gives Sysco Healthcare users a view on any contact or progress made during a once off or ongoing interaction. This can be utilised for customer service, compliance and provide historical references for every contact. 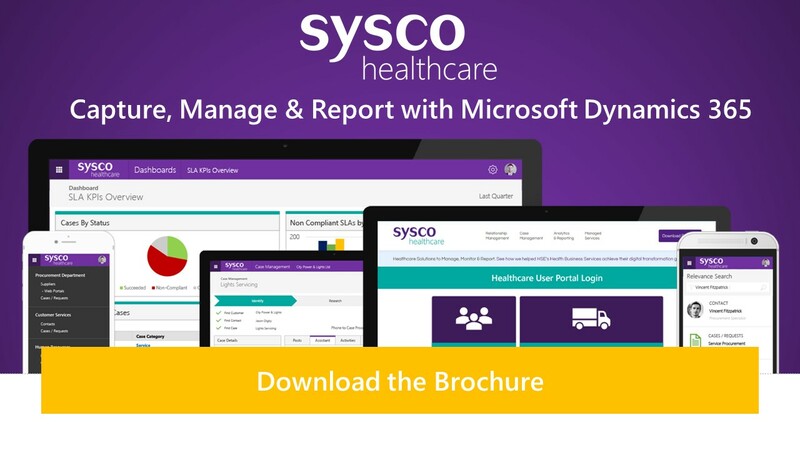 Office 365 Users can avail of full integration with the Sysco Healthcare Platform. This means your staff members can view emails from within Sysco Healthcare and also view information from Sysco Healthcare within Outlook without the need to change from one application to another. Office 365 Users can avail of full Sysco Healthcare Integration. View and Track Emails from within the web based client and add, edit or request submissions from Outlook without having to move applications.